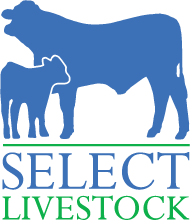 Select Livestock been at the superb British Cattle Conference in Telford, Shropshire. We were presented with ten papers from leading industry experts, including farmers, a PhD student, Heads of Genetics and vets. Two main themes struck me as the important take-outs from the beef day. Firstly, and a theme I blogged about last time, is knowing your costs of production. Central to this aspect at the British Cattle Conference was the increasing use of genomics in this process. As a beef industry, we now have access to increasing amounts of data that – if used collaboratively and correctly throughout the supply chain – could play a hugely profitable part in the breeding decisions farmers make. Dr Donagh Barry, an Irish geneticist, in particular gave a fascinating presentation on how using genealogy for breeding programmes can save money. Similarly, the Head of Genetics at the AHDB showed how you can decrease your farm’s chances of going down with TB by using sires proven to have progeny less susceptible to this awful disease. An award-winning Suckler herd farmer, Mr Billy O’Kane, from Northern Ireland opened my eyes to the margin-enhancing procedures and processes implemented at his farm that has grown his farm’s profitability per head by well over £100. He also de-bunked some myths about the size of Suckler cows; size doesn’t matter when looking at ease of calving or rearing healthy and good growing calves. In fact, he aims for cows no larger than 600kgs – anything more than this decreases stocking density. Smaller cows = more cows on the farm = more kgs of calf produced per hectare. As the well-known car insurance advert says, simples! 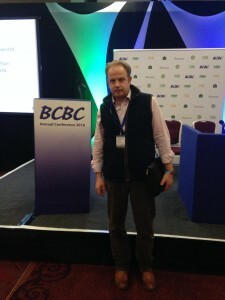 The other main theme of the British Cattle Conference was the impact of TB, and what we as farmers can do about it. Rex Ward from Cornwall gave a moving presentation on the 16 years his farm has been under the nightmare of TB. In that time, he has had 230 cattle culled, many of them in-calf cows and heifers. He reckons the financial cost to him alone is over £1m, without the emotional toll and lost days due to TB testing. The paper by Mr Den Leonard, a founding member of Excel Vets and a leading commentator on TB, did leave the conference with some cause for optimism, whilst acknowledging lost opportunities of the past. He cited the Cheshire TB Infection Eradication programme in the National Edge TB Control Zone as a case study of how farmers working together can provide evidence for a supportive UK government to build the case for controlling this disease in the wildlife. I am now off the bar to talk with fellow British Cattle Conference delegates and eat some fine British beef from Dovecote Park! It’s thirsty work, you know!